The story of the birth of Moses shows that God rewards those who are not afraid to do his will. 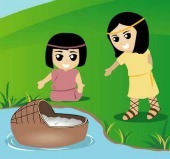 After the birth of Moses, to keep him from being killed, Jochebed hid Moses in the basket of bulrushes. The story of the birth of Moses illustrates how good can come out of a bad situation. Not only did baby Moses get to live, but his own mother got to take care of him. 9. And Pharaoh's daughter said unto her, Take this child away, and nurse it for me, and I will give thee thy wages. And the women took the child, and nursed it. The birth of Moses was the beginning of deliverance for the Israelites.